When the Stacy Adams Madison boots first came out in the roaring 1920s, mens dress boots were just as popular to wear as dress shoes. There was always something more regal about wearing dress boots like the Madison that gave a complete look. The Madison boot from Stacy Adams didn't take long to become popular for men who favor stylish dressing and have had a strong following ever since. 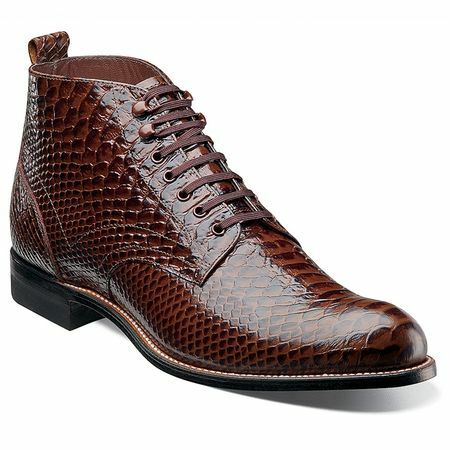 These are the all new style Stacy Adams Madison boot featuring rich dark brown anaconda snake print leather ready to bring a whole new generation of men who favor Stacy Adams shoes and boots. Featuring a full leather sole with Goodyear Welt construction that you get re-soled after loyal years of use, the Madison will make you appreciate the old school style of the 1920s like never before.